Just how much does California State University - Los Angeles cost for tuition now, and how much is tuition expected to change? How does tuition contrast with the average? Keep reading to find out. Learn how tuition and fees at California State University - Los Angeles match up to other universities and colleges and discover how you can effectively prepare for potential tuition increases. The subsequent table outlines how California State University - Los Angeles measures up to other schools nationally, regionally and by state. California State University - Los Angeles fees and tuition is reduced dramatically for students living in California. For in-state students, tuition and fees is set at $6,639 for the 2017 - 2018 year, 64.2% off the price charged to out-of-state students. Tuition is $5,742 and fees $897. California State University - Los Angeles out-of-state undergrads paid $18,519 in tuition and fees in 2017 - 2018. $897 was for fees, and $17,622 was tuition. Visit the Part Time Tuition & Fees page to learn more. 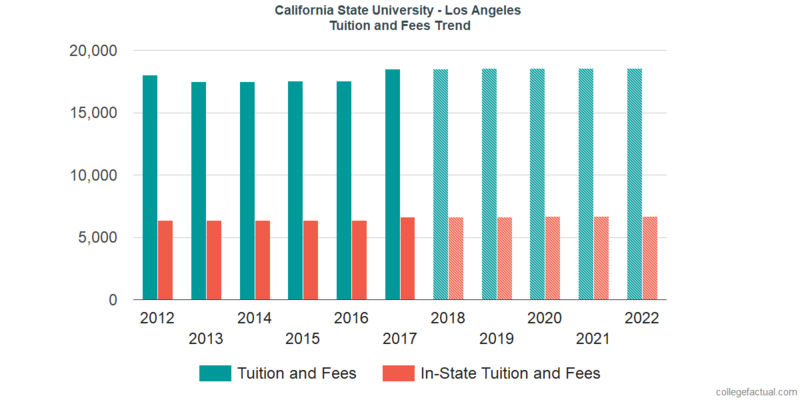 Tuition and Fees for out-of-state students attending California State University - Los Angeles grew with a typical yearly rate of 0.0% in the last 5 years. In the same time period, tuition grew by 0.0% and fees grew by 0.5%. Due to this, we estimate the cost of tuition and fees this year will total $18,526. For a two-year degree, we estimate tuition and fees will be $37,060 and $74,150 for a four-year degree. Remember, this does not cover additional charges such as room and board, books, and transportation. Look at this next chart to discern how California State University - Los Angeles tuition and fees may grow including residence based discounts in the future. Because of inflation along with other variables, the price of college is likely to grow every year. For this reason your final year of college might be much more expensive than your initial year.